Tai Chi for Health is recommended for Arthritis, Fibromyalgia, and maintaining strength, balance, flexibility, strength, and posture for older adults. The movements are gentle and look like a slow dance or shadow boxing. 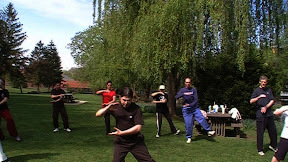 Our instructor has been practicing for over 25 years, and is a internationally recognized teacher of Tai Chi and Yoga.